Ad Hoc: For Temporary Relief of Hunger. Or, because you can never have too much Thomas Keller in your life. I thought I’d give you a little breather from my epically long French Laundry post before I launched into another Thomas Keller lovefest. My trip to the Napa Valley was specifically to eat at The French Laundry but I figured while I was there I might as well experience as much amazing food as I could and that meant more Keller, in the form of Ad Hoc and Bouchon Bakery. 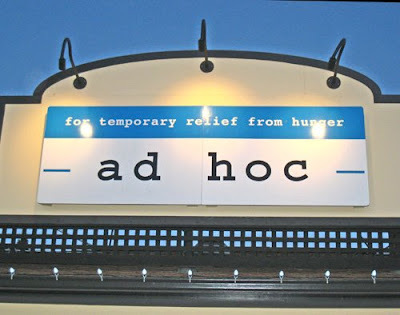 Ad Hoc, (which literally means, "for this purpose") was initially supposed to be a casual, temporary restaurant, serving family style four course meals that changed daily. The public response was so great that they couldn’t close. And for that, I’m glad. Ad Hoc is completely different from The French Laundry and yet it’s still Thomas Keller, through and through. When you compare them side to side, however, that may be difficult to see at first. Servers at TFL wear suits. Servers at Ad Hoc wear jeans and running shoes. The lighting at TFL is by candlelight and is dim and intimate. The lighting at Ad Hoc is bright with lots of reflective and shiny surfaces. Courses at TFL are individually and intricately plated. Courses at Ad Hoc are served family style for you to dish up however you’d like. What are the similarities? The food is outstanding, (though different, to be sure) and attention to detail is paramount. On to the food… First course was an Escarole and Pear Salad with Prosciutto Di San Daniele with torn garlic croutons and creamy olive dressing. The prosciutto melted in my mouth. I enjoyed every bite and it pained me to see the woman to my left doing her best to cut all the fat off her proscuitto. I wanted to tell her she was missing out on the best part! And then swipe it off her plate if she wasn’t going to appreciate it. The pear was a perfect addition to the salad and getting a bite with proscuitto, pear and escarole was delightful. 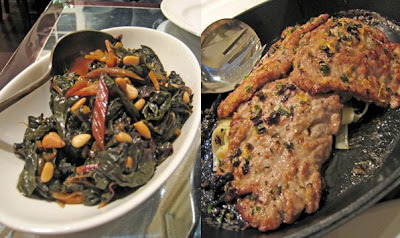 The second course was Veal Scallopini with Lemon and Capers, Braised Swiss Chard, Toasted Pine Nuts and Buttered Rustichella Tagliatelle. Basically anything that includes pasta is going to get high marks from me, but when you smother that pasta in butter, I’m completely sold on it, (sadly the pasta is hidden under the veal in my pic so you can't actually see it in all its glory). I was happy to see veal on the menu too because it’s not something that I prepare very often at home. This trip has definitely changed my habits though. Since coming home I’ve been making an effort to branch out more and try making things that I ordinarily wouldn’t have, (I actually just bought veal chops today). A cheese course is featured on the menu at Ad Hoc and on this day it included, in addition to cheese, Marshall’s Farm Wildflower Honey and Spiced Mixed Nuts. I’m becoming a big fan of cheese courses and they’re also something that I wouldn’t have thought twice about in the past. While in Napa I started having afternoon snacks of a few different slices of cheese with a chunk of crusty bread and some honey. Since I was in the land of wine, I had a glass of that too. I really need to carry on that tradition at home. 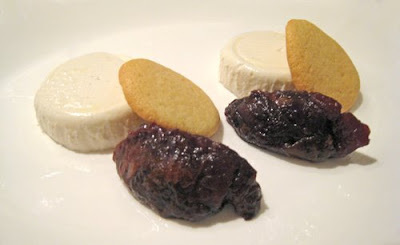 Finally, dessert was a Buttermilk Panna Cotta with a Vanilla Cookie and French Prune Marmalade. This dessert piqued my interest in panna cotta, which I had previously not had a very high opinion of. Apparently I just hadn’t had it done properly. The panna cotta at Ad Hoc was soft and creamy and lacked that gelatinous, borderline jello-like mouth feel that I previously associated with panna cotta. It was a simple but elegant finish to the meal. 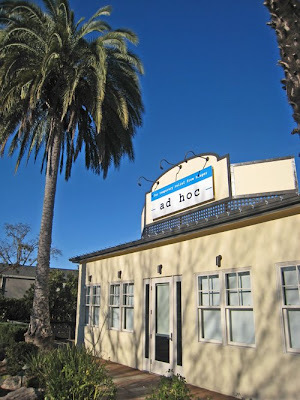 Dining at Ad Hoc made me wish I lived in the Napa Valley because it’s a spot that I would make return visits to. For someone who doesn’t like to go to the same restaurant twice, that’s saying a lot. In fact, contrary to what my posts of late would have you believe, I rarely dine out. When I do, I usually like to try out new places. For the most part though, I find that I’d rather make my own dinner than go out to eat where I pay too much for food that I could make better and for less money. Ad Hoc, however, at $49 for four courses, is a place at which I wish I could be a regular. And since the four courses change nightly I get the benefit of variety combined with the comfort of returning to a place which is familiar. If I lived in the Napa Valley, I would also be making return visits, (almost daily, in fact) to Thomas Keller’s Bouchon Bakery. I bought bread and treats there every day, (I couldn’t resist the TKOs- Thomas Keller Oreos) and spent an almost creepy amount of time staring through the windows to watch the bakers at work. It made me want an enormous bread oven of my own and a Master Baker to show me proper technique. Bouchon Bakery supplies bread to all of the Keller restaurants in Yountville so they work around the clock pumping out beautiful and delicious loaves of bread in all shapes, sizes and types. Just writing about all the great food I had on my California trip has made me want to get back in my own kitchen. It was certainly inspiring on a culinary level and I’ve got tons of cooking and baking ideas that need to be worked on so that I can achieve temporary relief of hunger too. Posted by Brilynn at 8:36 p.m.
Look at you just eating up a storm. Very jealous. Places like this just inspires you to cook doesn't it? I am so very envious of your experience. Sounds like a wonderful food fest. So creative! It all looks so delicious. And what I would give to be in California right now. You are so lucky! Looks like a fabulous place! Thanks for sharing!